In celebration of the App Store's 10th anniversary, we're taking a look back at its history, starting with the web apps and unofficial apps that preceded it! Flashback. Before the iPhone and the App Store there were many different web-based software fiefdoms for PalmOS, BlackBerry, Symbian, and Windows Mobile that collected a hodgepodge of different freeware, shareware, and commercial apps, attached to a variety of check-out systems, employed inconsistent and often annoying licensing schemes, and required a lot of work to install and make work. And they were relatively expensive by today's standards. In short, mobile apps were ripe for revolution. When the iPhone was introduced at Macworld 2007, it ran just over a dozen built-in apps. That there was a lot of empty space on the Home screen - gaps in the grid where another app, and another row of apps, could fit - seemed to suggest something more was coming. The iTunes Store app showed Apple could take their desktop-based ecommerce platform and make it mobile. Indeed, a YouTube app was added before launch, and an iTunes app would be added in the fall. The latter was the more interesting. 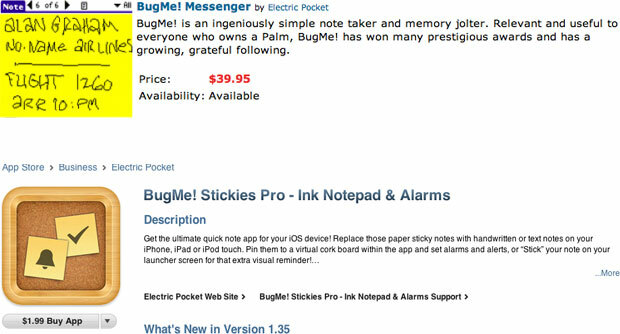 The iTunes Store app showed Apple could take their desktop-based ecommerce platform and make it mobile. And not only could they sell digital content to customers directly on the iPhone, they could do it in as unified, simple, and secure a way as always. Could, however, didn't mean would. Demand for a way to create third-party apps for the iPhone was thunderous. 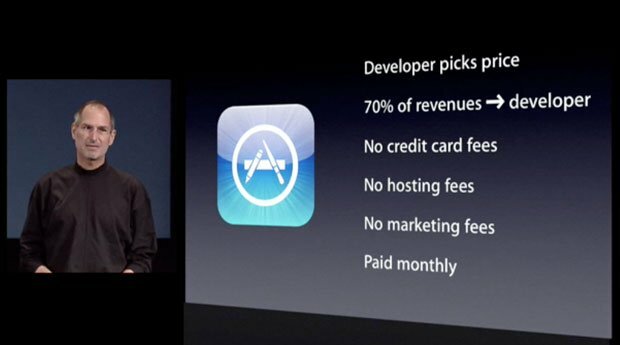 At WWDC 2007, just before the original iPhone launched, Steve Jobs announced Apple's answer to a development platform: Web 2.0 + AJAX (now known as HTML 5). Web apps was the "sweet solution" he offered. He bullet-pointed that no SDK was required, and that web apps could look and function just like the built-in apps. They could even use URL strings to call phone numbers or launch emails. A lot of creativity followed, and developers did indeed create games, Twitter clients, todo lists, and more. As a solution, web apps were more sour than sweet. But back then, the limitations of web apps, their lack of access to core functionality, their relatively poor performance compared to native apps, and the difficulties involved in charging for them proved to be insurmountable problems. Apple continues to promote HTML5 as the open alternative to the App Store. Google, Facebook, and even Apple continue to make great web apps. But the writing on the wall - and the icons on the Home screen - made it obvious to everyone, including Apple, that just like first party apps before them, third party iPhone apps had to go native. The original iPhone was jailbroken less than a month after release, and a web based jailbreak became available in the fall of 2007. Jailbreak let unsigned code run on the iPhone, and that meant apps could be run outside of the ones Apple built in. In other words, real third party software was now possible. Twitterrific was born, as was Lights Off and Tap Tap Revolution. They even developed their own Linux-style repositories, including Installer.app, and later, Cydia. There are all sorts of rumors about various executives at Apple pushing for or against a native App Store. The reality, as is often the case, was more about resources than resolve. Apple's teams had only just completed the forced-march that was needed to ship the original iPhone. To ship an App Store would require yet another forced march. A marathon made of sprints. Various options were explored, and in the end Henri Lamiraux and his team picked themselves up and started sprinting again, this time towards a Software Development Kit (SDK). Internally, Nitin Ganatra and Apple's mobile apps team moved from the previous application programming interfaces (API) to the same ones being used in the SDK, so Apple would feel pain and fix things before they hit developers and their shared customers. And a platform was born. On October 17, 2007 Steve Jobs wrote an open letter on Apple.com's Hot News page, announcing an iPhone SDK (software developers kit) for the spring of 2008. Let me just say it: We want native third party applications on the iPhone, and we plan to have an SDK in developers hands in February. We are excited about creating a vibrant third party developer community around the iPhone and enabling hundreds of new applications for our users. With our revolutionary multi-touch interface, powerful hardware and advanced software architecture, we believe we have created the best mobile platform ever for developers. It will take until February to release an SDK because were trying to do two diametrically opposed things at onceprovide an advanced and open platform to developers while at the same time protect iPhone users from viruses, malware, privacy attacks, etc. This is no easy task. Some claim that viruses and malware are not a problem on mobile phonesthis is simply not true. There have been serious viruses on other mobile phones already, including some that silently spread from phone to phone over the cell network. As our phones become more powerful, these malicious programs will become more dangerous. And since the iPhone is the most advanced phone ever, it will be a highly visible target. Some companies are already taking action. Nokia, for example, is not allowing any applications to be loaded onto some of their newest phones unless they have a digital signature that can be traced back to a known developer. While this makes such a phone less than totally open, we believe it is a step in the right direction. We are working on an advanced system which will offer developers broad access to natively program the iPhones amazing software platform while at the same time protecting users from malicious programs. True to his word, at the iPhone OS 2.0 preview event in March of 2008, Apple introduced the first, official, Objective-C based iPhone SDK. They would allow 3rd-party apps, but would be carefully curating them. Apps would have to be approved for the App Store, and aside from a very narrow ad-hoc distribution channel, no side-loading would be permitted. Likewise, no code interpreters, so no Java, Flash, or similar runtimes could be used on iOS. Because Apple already had the vast iTunes checkout system, they had an incredible advantage when it came to rolling out a store. Just like with iTunes media, they could handle credit card and transaction processing internationally. The iTunes Store also meant they already had infrastructure to handle large-scale digital distribution. They supplied both, along with the marketing muscle of their storefront, free for free apps and for a 30% cut of paid app revenue. My first impression was that [the 30% cut] seemed a little high, but acceptable. You're getting someone else to deal with the hassles of downloading, payment processing and, to some degree, promotion. There's a lot of value in that. Look at what it costs to be on other plaforms, such as Xbox Live, and it seems fair. But thinking through the situation a bit more, I realized that those things pale in comparison to the value of being associated with the Apple brand. Having their explicit stamp of approval and being included in the App Store will make any product more appealing to a customer. Buying directly from Apple means that your software won't screw up their phone and that can be returned if it doesn't live up to expectations. That, combined with the ease of a single click purchase, is going to drive a lot of sales. You'll make up that 30% without even trying. And just like that, Apple went from launching the first in a new generation of mobile, if closed computing platforms, to enabling the first in a new generation of mobile software. They went from zero... to the App Store.